Okay, I love tripe, what can I say. 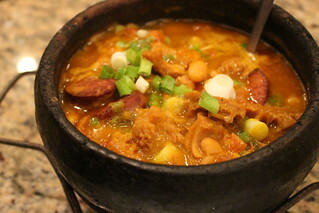 This stew was hearty and packs a lot more flavor, so perhaps the more subtle muqueca was being undermined. 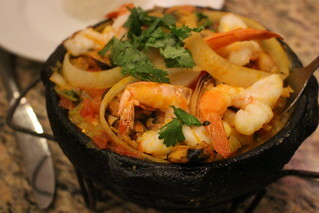 I should try the muqueca on its own next time. I loved the tender tripe and the sausage that's full of spice! This seemed like the Bahian style moqueca, but with crab meat and plantain moqueca on the side? And crab meat always makes everything better! Because of the coconut milk, this stew is richer and heartier than the Espirito Santo-style moqueca. 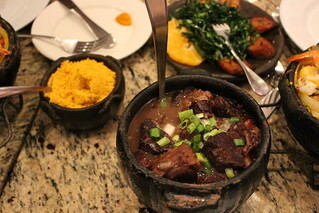 It's a great feijoada and ended up being the table favorite. Hey, there's a reason that it became the national dish. There's also another reason to like this place: their caipirinhas. 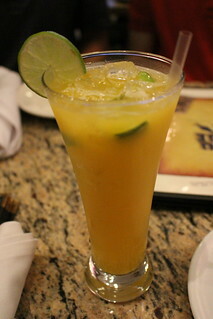 They have the traditional one with sugar and lime, but also others mixed with passionfruit (pictured below), kiwis, etc. The best part? They're only $6.50. Yep, $6.50 cocktails. 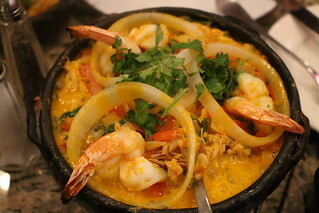 I was quite happy to find Muqueca, especially given its walking distance to my house! There are a lot of Brazilians in the area, allowing restaurants to serve more than the typical dishes. I'll definitely be back to have more tripe stew and try other dishes - while drinking cheap caipirinhas.